My reviews for the three individual books in the Remembrance “Mem” Nye Trilogy are shared from Goodreads.com. I’ve used Goodreads’ raking system where 3 stars = “liked it”, 4 stars = “really liked it”, 5 stars = “it was amazing”. At the recommendation of a friend, I read the YA novel, JOURNEY TO NOWHERE, and enjoyed it thoroughly. The author’s note at the conclusion told me much of what I’d suspected: significant research filled in the background of the Nye family’s journey from settled Connecticut in 1815 to the western frontier of upstate New York. The rich texture woven into the tapestry of the setting snagged my attention and held it fast. I learned so much about early 19th century day-to-day living through the eyes of eleven-year old Remembrance “Mem” Nye. 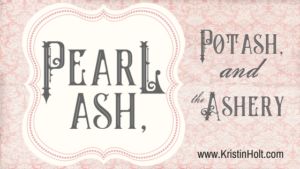 While obviously written for youth, I found it more than enjoyable and would recommend it to adult readers who fancy American historical fiction. 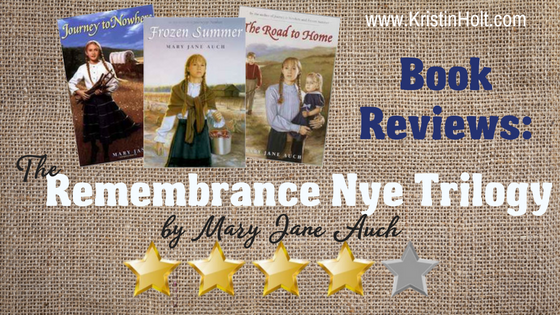 I enjoyed FROZEN SUMMER (book #2 in the Remembrance “Mem” Nye series) right after book #1 and enjoyed them both very much. The historical accuracy of the 1816 summer-that-wasn’t when New England experienced winter-like temperatures and severe crop failures made for an exciting backdrop for Mem Nye’s story. I felt such compassion for this 11-year old girl who wanted to somehow salvage her family, obey her parents, protect her newborn sister, and somehow manage in the heavily forested Genosee Country without extended family, nearby neighbors, or comforts of civilization. Mem had to grow up fast. Mary Jane Auch presents a Young Adult novel that captured my attention, engaged my deeper emotions, and made me care about the fate of three young children as their mother slipped away from them. THE ROAD HOME is a most suitable conclusion to the Remembrance “Mem” Nye Trilogy. Mem turns 13 years of age in this book, and she has her hands full with a difficult younger brother Joshua and 1-year old baby sister Lily. Just when I thought their family couldn’t (or shouldn’t) unwind further, Mem faces even greater obstacles in the 1817 relative frontier of western New York. One of the hardest realizations Mem comes to (as well as most human beings) is reconciling the love of a parent with the truth of that parent’s failings, faults, and imperfections. Mem’s already lost her mother–now her father’s signed up to work the Eerie Canal and she’s essentially on her own. The story progresses in such a manner that I cared about the children, their needs, their struggles, and found the conclusion to be a surprise and yet most rewarding. True to history, it’s the only ending that makes sense. I’m pleased to say I didn’t see that ending coming. This book is appropriate for readers of all ages. It may have been written for youth but I found it entertaining and enjoyable.